Affordable Denture Services | Ellsworth & Brewer, ME | Midcoast Denture Design, P.C. Book an appointment to get your new or replacement affordable dentures. We’ll fix you up with these so you won’t have to worry about an incomplete smile. Trust our team to repair and maintain your affordable dentures as often as needed. Call or email us today to schedule your affordable denture service in Ellsworth and Brewer, Maine. Trust our team to provide the denture services you need, when you need them most! 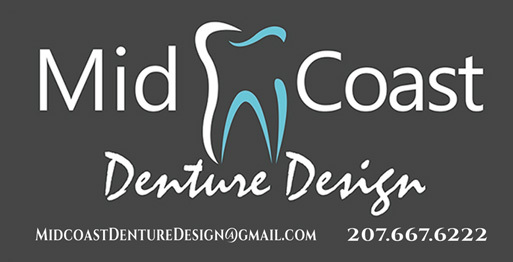 Midcoast Denture Design, provides a variety of full and partial-denture services. We are located in 2 convenient locations (1) Ellsworth, and (2) Brewer to better serve our communities with quality dental care. We offer Immediate dentures, which can be inserted directly after extractions; as well as replacement full and partial dentures. With our on-site dental laboratory all of our dental prosthetics are made in house to insure quality products at an affordable cost. Midcoast Denture Design also offers an on-site dentist, who can provide full mouth extractions as well as dental care that can used to retain either full or partial dentures. The team at Midcoast Denture Design wants you to have a smile you can be proud of. We strive to provide a relaxing and comfortable experience, so you can focus on helping us create the smile you have always dreamed of. Do you need your dentures relined? Relines, Rebases, or repairs can be affordable option to help prolong the life of an existing denture. Many repairs can be completed within 1 hour. Rebases/Relines are available for same day impressions and pick up. An ill-fitting denture can be very frustrating. A rebase can re-fit dentures or partial to accurately fit the oral tissues.